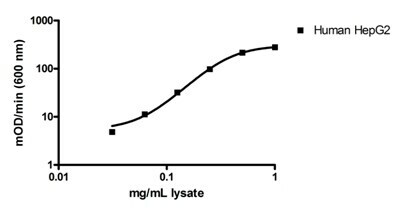 Catalase Activity Assay Kit ab118184 is used to determine the relative specific activity (activity and quantity) of catalase in a sample. The native enzyme is immunocaptured within the wells of the microplate; this removes all other enzymes. The catalase assay buffer contains hydrogen peroxide which reacts with a substrate to make a luminescent product. Catalase functions rapidly to remove hydrogen peroxide from the solution and reduce the production of light. Therefore the light produced in each well is inversely proportional to the amount of catalase activity. After catalase activity measurement the quantity of catalase is measured by adding an anti-catalase detector antibody to each well. After washing away unbound detector antibody, HRP-conjugated label specific for the detector antibody is pipetted to the wells. The wells are again washed, a TMB substrate solution is added to the wells and color develops in proportion to the amount of catalase bound. The developing blue color is measured at 600 nm. Optionally the reaction can be stopped by adding hydrochloric acid which changes the color from blue to yellow and the intensity can be measured at 450 nm. 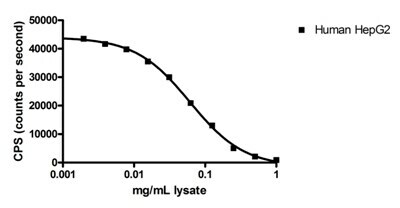 Example sample curves demonstrating the working range of the assay for a human and cultured cell line lysate (HepG2). 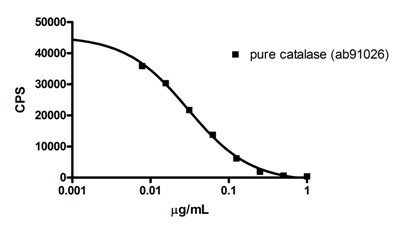 Example standard curve for the purified human catalase sample ab91026. 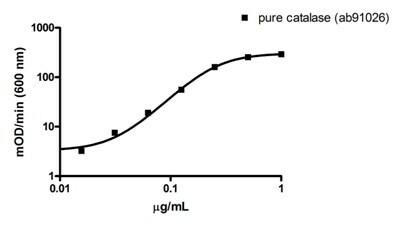 Example relative specific activity – comparing the activity and quantity of purified erythrocyte catalase (ab91026) and catalase from human hepg2 lysate. 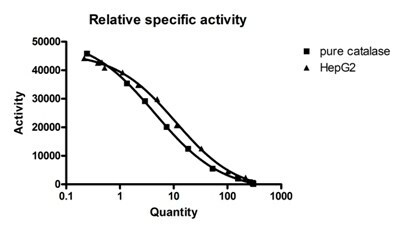 The HepG2 sample is determined to have a higher specific activity rate. I am interested in your Catalase and Superoxid Dismutase Activity Assay Kits. Is it possible to use frozen tissue for the assay (stored at -70°C)? Laut unserem Labor ist es völlig in Ordnung, wenn Sie gefrorenes Material verwenden, da wir dies teilweise auch in unserem Labor verwenden.